MICHAEL ST. JEAN Michael St. Jean just might be more in the business of community building and economic development than real estate sales. That’s because, in the Hamilton, Ontario, region his team represents, he has become a force for good, promoting advancement of the city and its surroundings, which are experiencing an astounding revival. “We also do some work in the Niagara region of Southeast Ontario, but Hamilton is our epicenter,” says Michael, who grew up in a real estate family and entered real estate more than 11 years ago. After quickly outgrowing a major brokerage, he began building his innovative, privately owned brokerage. Given its formal mission of “Helping Hamilton Grow,” St. Jean Realty has branded itself as a business that is supporting the transformation of this former steel-making city. After steel production moved largely overseas in the 1980s and Hamilton underwent a long stagnation, the city has seen a dramatic turnaround in the past decade. “Hamilton has diversified its economy into the health, sciences and education fields and we really have taken control of our destiny, moving forward in some really amazing ways,” explains Michael. In addition to helping people buy, sell and invest in real estate, St. Jean Realty is leading the call to continue improving life in Hamilton. And they are succeeding. “Whether it’s helping a senior citizen size down, helping a first time buyer get their home or assisting someone who’s coming to Hamilton from another part of Ontario, our greater mission, ultimately, is to help Hamilton grow,” he says. “We also do a lot of development work on my team; we have several existing projects already and a lot coming over next few years.” The team has been at the ground level of change in Hamilton and each member is proud to be moving forward with projects that are “changing the game” in their city. Their ability to affect change is the result of fine-tuned processes, systems and organizational operations. “We are very structured in the way we work,” says Michael. “We have processes for everything from A to Z, which means when we take on new agents, we train them and provide them with the support systems of a world-class brokerage.” The company’s systematic processes are the foundation on which the entire business is built, with each uniquely talented team member sharing common goals. From widespread yet highly targeted listing marketing to automated but personalized communication and inventive ways of connecting with the community, St. Jean Realty is well-known across Hamilton. “We have a weekly email newsletter that’s packed with useful content on what’s happening in the community, with the team and with any developments or listings,” says Michael. “We also do targeted social media blasts of information and content with advertising and retargeting and we even do a lot with radio, TV, and a large outdoor billboard campaign.” Their mission is top-of mind within Hamilton as clients hear, see and witness their locally presence. For Michael, the joy of real estate lies in his company’s ability both to help individuals and a changing community; helping individuals’ goals while simultaneously helping a city. “Even our community involvement has been centered around selling the city itself,” he says. “We’re been promoting the city to people from other areas; we’ve taken the torch and are running with it as the people who are responsible for communicating why this is an amazing place to live, work and play.” By ushering in new investment that advances Hamilton, St. Jean Realty is realizing its goals and helping others do the same. “We’re still in the very early innings of our team and our business,” says Michael, who is expanding his resale residential team while increasing his development sales business. “We are going to be working on some of the greatest projects Hamilton has ever seen.” The future, by extension, looks incredibly bright for both St. Jean Realty and for Hamilton. To learn more about Michael St. Jean, visit stjeanrealty.com or go to his Facebook page, email michael@stjeanrealty.com or call 1.844.484.SOLD www. 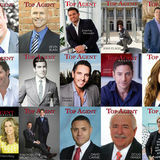 on being featured for Canada in Top Agent Magazine! To find out more about Zachary K. Underwood, visit his website at triohiorealty.com, call 330-853-6738 www. ALEXANDRA McCAULEY How did Alex McCauley quickly become one of the most trusted and referred agents in Houston? Alex never thought she’d leave her native California, but when she fell in love with a Texan, she moved to the Lone Star State in 2013. She’d grown up watching her uncle run a successful real estate appraisal business and always had an interest in the industry. So when she arrived in Texas, she studied for her license. After her receiving her license, she kept her full-time sales job for a yearbook company while building her real estate business. “My yearbook sales job involved travel in the area, so it helped me get a feel for the different areas of the city. It helped me in real estate because anytime someone wanted to see something anywhere I had a pretty good idea of school districts and things that were important to families,” she explains. She went full-time with Keller Williams in 2018 and serves primarily the inner loop of Houston with a focus on Oak Forest—where she lives, the Heights, Cottage Grove, Montrose, Eado, Rice Military, Memorial, and Spring Branch, as well as Conroe, the Woodlands, and Spring. negotiating contracts. “I’ve been in a lot of multiple bid situations where we always win the house,” she says with her characteristic smile. Her clients remember that working with her was a pleasant, easy, low pressure experience. What’s Alex’s favorite part of the job? “It’s the people!” she says. “I enjoy spending time with my clients. I enjoy taking them out to look at properties and getting to know them. I’ve found my niche and I can’t imagine doing anything else. I wake up enjoying what I’m doing and it’s fun. It doesn’t really feel like work.” Through Keller Williams, she volunteers to feed the homeless, provide clothes for children in need, and support survivors of Hurricane Harvey. In her free time, she loves to relieve stress by working out and running, and she’s currently training for Chevron Houston Marathon. She and her husband have a French bulldog puppy named Astro (in honor of the Houston Astros) who is a handful! For the future, Alex plans to continue growing her business while maintaining her personalized, boutique service. his service, he developed an attention to detail and a strong work ethic he brings to his career as an agent. Jeremy understands that in today’s market, most buyers begin their search for a home online. To ensure each listing looks its best, Jeremy and his team hire stagers and professional photographers, as well as high quality vendors to complete any needed improvements. For his luxury listings, he uses Lux Virtual Touring, which provides advertising nationally and world-wide, as well as single property websites. He utilizes Listing Booster to share information with potential buyers, who receive a virtual tour link and information on area schools. The result of this thorough marketing approach is often a quick sale at a competitive price. After working with Jeremy, his clients remember not just his excellent service and expertise, but also his good nature, sense of humor and ability to make the process fun. His favorite part of the job is meeting new people every day. To give back to the community, he volunteers with Court Appointed Special Advocates (CASA) as an advocate for foster children. He’s a member of the American Legion where he focuses on giving back to other veterans. In his free time, he loves to spend time with his family, traveling, bowling, and mountain biking on the local trails. His 19 year old daughter, Lexie, is currently taking classes to obtain her real estate license. “For the future, I’m hoping to make it a family business!” Jeremy says. Now that’s a worthy goal that will surely benefit his clients and community! To find out more about Jeremy Cupp, contact him via email at jeremy@12stonesnwa.com or by phone at (479) 340-4744. 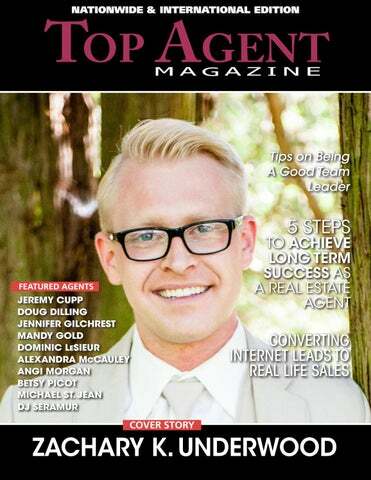 You can also check him out online at jeremycupp.realtor www. inspire conversation, politeness, and following up regularly—to name a few. Likewise, there are surely new tricks you can add to your arsenal to stay ahead of the curve. Let’s outline a few ways you can refine and update your email etiquette to compete in today’s virtual marketplace. Make your subject line count Too often, we labor over the content of our emails without giving much thought to subject lines. Though email is no longer a new-fangled invention, there are certainly ways you can modernize its use and take advantage of its ubiquity. However, these little headlines can go a long way in luring the consumer to open your email and ultimately click through to your website in search for your services. An enticing subject line should be short and sweet, ideally less than fifty characters. You might also include the name of the recipient, and be up front (though concise) about the subject matter of your message. Remember: the first thing a client will see is your name and subject line—be sure to make this prime real estate shine. Think mobile Research tells us that 79% of Americans check their phones within fifteen minutes of waking up. In fact, much of modern day correspondence occurs by smartphone. Accordingly, you’ll want to account for email readability on a mobile phone. For instance, incorporating paragraph breaks for each new thought allows information to be parceled out in a palatable way for readers utilizing small screens. Also, any sort of graphic flair or links within your email should be shortened and streamlined for mobile consumption. Send yourself an email every now and again and access it from your phone—you’ll be able to double-check that all the elements of your emails are working well on a mobile platform. you can add spellcheck, a URL address shortening feature, or a delay option that holds emails for thirty seconds before they’re sent. Think about the possibilities! Haven’t you sent an email without including the attachment you intended, or realizing you sent correspondence to the wrong client? If that’s the case, a delay feature can help you save face and build in a window for error— just in case. Regardless of which tools speak to your email habits, there are plenty of add-ons out there that can revamp your digital correspondence style. Use email to maximize your online presence These days, there are plenty of ways to communicate—email, text, phone, apps, and social media. When you interact through email, consider it an opportunity to invite your client to follow you elsewhere online. Ensure that your email signature includes unobtrusive, streamlined links to your social media accounts, professional website, or review page. This will build in an opportunity for clients to engage with your brand, and you may even add an online follower for the long term. Though email is no longer a new-fangled invention, there are certainly ways you can modernize its use and take advantage of its ubiquity. Keep these approaches in mind as you reenergize your email technique and fortify your communication in the digital era. coordinator in office allows me to be in front of more clients face to face and I am at ease knowing she’s on top of every single detail.” Jennifer sincerely appreciates her clients, past and present, and works hard to maintain the deep bonds she forms with many of them. That appreciation is clearly reciprocated, as best evidenced by the glowing reviews she has received for her services, including this one from Zillow.com: “We interviewed several Realtors before we chose Jennifer. We are very pleased with our decision... Jennifer was amazing to work with! She was always available when we needed her. If she did not know the answer to a question she would research it until she had an answer. No job was too big or too small for her. If we ever buy or sell again we will definitely choose Jennifer.” Expert, thorough marketing also plays a huge role in Jennifer’s continuing success story. In addition to standard methods that take advantage of the internet and social media platforms, Jennifer also employs more personable methods. “I actually do a lot of door knocking,” she says. “On Valentine’s Day, I handed out candy all evening, and door knocking as the Easter Bunny and delivering candy as well.” Newsletters and flyers also ensure that anyone who needs expert guidance knows where to find her. When she’s not working, Jennifer enjoys nothing more than spending time with her husband, their children and their two grandchildren. Church on Sunday as a family is important to them in particular. “Sunday is our family day, when we try to slow down, reconnect and catch up with each other,” she says. Jennifer is also a huge sports fan. “MMA is actually my favorite,” she says with a laugh, “which shocks everyone.” The entire family are also dedicated philanthropists who give back to the community through variety of local charitable organizations. ‘My family’s support of me is off the charts,” says Jennifer. “I have the most loving, supportive family imaginable.” The future looks bright for Jennifer, and her primary plan is to continue growing her business. Her impressive customer service – which has become her calling card – will, of course, remain front and center. top-five nationwide.” But he does none of this for the attention. His friends may call him the “Humble Hero of Heroes,” but helping is Mario’s passion. “To be such a small business and be the top Homes for Heroes affiliate is mind boggling!” Like Mario, for many, the best service takes place in simple and quiet ways. Illinois REALTOR®, Susie Scheuber, for example, takes a humble approach to giving back. Although she donates a portion of every commission check to the Children’s Miracle Network, she doesn’t discuss this with clients unless they happen to ask. “I do it because I want to and because, to me, giving back is the right thing to do when you’ve been fortunate in business and life,” says Susie. We all know how inertia works; the more energized we get by certain behaviors, the more likely we are to continue those behaviors. For some top agents, community outreach has become such a natural routine of their daily lives that they never find it burdensome. A good way to add community service into your life, therefore, is through the causes that mean the most to you. For starters, consider giving a small donation after closing to the charity of your client’s choosing. Learning the different causes that they care about just might foster a new mission for you. One aspect of her job that Mandy takes particular pride in is her affiliation with the Homes for Heroes program, which has helped local Military (active, reserve and veterans), Firefighters, EMS, Law Enforcement, Healthcare Professionals and Teachers save a significant amount of money when purchasing a home. “It’s kind of my driving force right now,” she enthuses. “It’s a great program, and it lets them know that they’re appreciated for their selflessness.” Perhaps the most common complaint heard about real estate agents is poor communication, and there are innumerable buyers and sellers who lose out on deals while waiting for return phone calls. Not so with Mandy, who makes it a priority to return every phone call, email and text as quickly as possible. “My buyers and sellers know they can always reach me, and they can always get fast answers to any questions they might have,” she says. While the financial rewards of a career in real estate are not easily discounted, it’s the more personal side of the business that provides Mandy with the most job satisfaction. “I love being able to call my clients to say, ‘congratulations, let me bring you the keys to your new house,’” she says. “At the end point of the transaction, they’re usually very happy, and I think that’s the most rewarding aspect of what I do.” When she’s not working, Mandy enjoys spending time with her husband and their four children, and encouraging in their after-school activities. She also coaches local youth with dancing and baton twirling. Mandy, a true entrepreneur, also owns a spray tanning business that keeps her occupied during those rare hours she isn’t working with buyers and sellers. Mandy’s future looks as bright as her past, and her goal is to grow her business while enhancing and growing her already-exceptional reputation as a Realtor who provides the very best customer service available. BETSY PICOT Betsy Picot’s legacy in real estate stretches more than forty years and multiple states. Beginning back in Ohio, Betsy had always toyed with the idea of becoming an agent, but never acted on her curiosity until the right opportunity finally aligned. From there, over moves to New York and Michigan, she advanced her career as an agent and as trainer—parlaying her love of teaching as she served as a training director for more than ten years and passed along her insights to a range of agents along the way. Today, Betsy has been based at her Florida office since 2001, where she has built upon her abiding reputation for professionalism, follow-through, and empowering her clientele through market knowledge. presentations and preparations are up to snuff before and after a listing’s debut. While Betsy has refined her real estate approach over four decades of experience and insight, she is also no stranger to moving, training new agents, and acclimatizing to new marketplaces. As such, her adaptability and patience are the surest markers of her success, and she passes along this knowledge and value to the clients she steers. “Above all, what I want my clients to remember about me is that I got the job done in a timely manner, and I did my best to make the transaction as easy and seamless as possible,” she says. Beyond the office, Betsy is active in the St. Johns Golf and Country Club Book Club she helped found, and enjoys exercise, as well as the occasional bout of travel. She also enjoys time spent with her family, especially her grandchildren. To learn more about Betsy Picot email BPicot@WatsonRealtyCorp.com, visit BPicot.WatsonRealtyCorp.com, or call (904) 891 – 2144 www. a moment before replying. “It’s because I’ve taken care of my clients,” he says. “I get calls from them all the time when they’re in a difficult situation, like a divorce, and need to sell their house quickly.” There are other reasons, as well, namely his construction expertise. “I have a list of contractors and sub-contractors that I’ve been using for years and I can always call on someone to help them.” DJ is not adverse to lending a helping hand himself, and can frequently be found personally addressing repair issues when prepping a home prior to listing. Expert, thorough marketing is also an important factor in DJ’s success story. “I’m very hands-on,” he says, when asked how he helps prepare a sellers home. “I take the photographs myself, and I’ll consult with the client regarding any staging that is needed. I also make sure that any needed repairs are done in advance, because it’s more expensive if they’re done after the appraisal.” A robust online presence guarantees that his listings are seen by as many potential buyers as possible, and his waiving of industry-standard processing fees for his clients has endeared him to his grateful customers. “The last thing a buyer needs to do is pay another fee,” he explains. “ A lot of time they’re already financially strapped and I’m not going to nickel and dime them.” During those rare moments when he’s not working, DJ enjoys nothing more than spending time with his wife and two young children. He is also a coach for the Valparaiso Soccer Club and Wrestling Club. Additionally, he is active with the local Chamber of Commerce and gives back to his community through his support of local events. When asked about his plans for the future, DJ expresses a desire to continue growing his business, and hiring additional quality agents who share his client-first business ethos. More than anything, however, he plans on continuing to provide the unparalleled service that has become synonymous with his name.